Shows continue sporadically through 2014 – Dates, a preview and information are listed at the Red Ladder site. Wrong 'Un is now up and running. A one-woman musical, featuring Ella Harris in the acting role and Justin Audibert as Director. 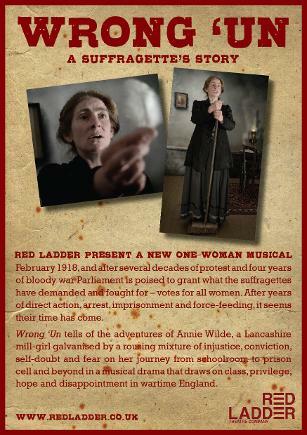 Essentially the play is the story of Annie Wilde, a Lancashire suffragette, with songs and jokes peppering Annie's story-telling. Ella is brilliant. She lives and breathes the narrative, turning it from a script into something both intimate and powerful. She's an amazing actor. Justin's been brilliant, too - all through the rehearsal process he was picking apart the lines, chopping things around, choreographing the story. I'm still a little in awe of the theatrical process – especially in how much of it is collaborative. The idea with the play was that it wouldn't go off on tour and then disappear but could be performed as and when it gets booked into venues. As long as Ella's available, it can be performed. Not just in theatres, either - the first Big Bookend performance took place in a large upstairs room of Leeds Central Library, polished wooden floors and the walls lined with books. Hopefully Wrong 'Un could be just as much at home in an upstairs room in a pub as it would be in a theatre. 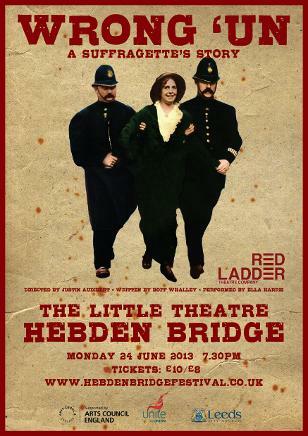 Wrong 'Un tells of the adventures of Annie Wilde, a Lancashire mill-girl galvanised by a rousing mixture of injustice, conviction, self-doubt and fear on her journey from schoolroom to prison cell and beyond in a musical drama that draws on class, privilege, hope and disappointment in wartime England. the audience who are invited to sing along.